From Cork City, Ireland; 38 year old Andy Dunne has been entertaining and songwriting for over 20 years.The youngest of 13 children, he grew up listening to music of virtually every genre.His Father Jimmy was a singer, drummer and accordion player in the Ceili and Dance Band days. His Mother Mary sang in industrial choirs and his Uncle William Dunlea was an internationally acclaimed tenor. Add these influences to the musical genres that his older siblings would have both played and listened to and you will then begin to realise the understanding and love that he has for the art. Today, His styles of writing and performing transcend genre and are as diverse as his influences. Among them, Willie Nelson,Talking Heads, Shane McGowan,Jimmy MacCarthy,Clifford T Ward, Billy Joel, Janis Ian and Tom Waits. His musical career to date has also been quite diverse. In the late 80's andy worked in a Cork City club (Delacy house) playing support to artists such as Mary Black, Freddie White and international stars, Big Country, Midge Ure (Ultravox) and Country Music legend, Guy Clarke (Desperado waiting for a train). 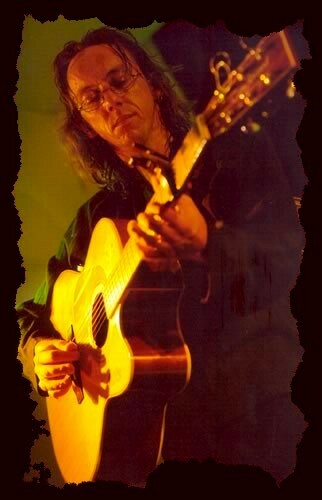 In the early 90's, Andy toured as singer and rhythm guitarist with irish traditional music legend, Davey Arthur. From there he went on to tour as a solo artist around Germany and the USA, building a consistant following on the "Irish Folk Music" circuit. This period was to awaken in Andy a real interest in the history and diversity of the music from his native Ireland. This played a key role in the development of what is today the melodic and percussive Andy Dunne sound. His songwriting has also gained from these influences. An Irish or Celtic ambience can be felt in Pop/Rock songs such as "Evolution" and "In all my time". Ballads "Take this man" and "Northern Star" while almost fitting into the Country Music genre also have an Irish Folk vein. Andy's deep knowledge of song crafting is evident in "Love". A truly well written and arranged song. These days as well as playing and recording as a solo artist Andy has become an intricate part of Cork based Folk and Ballad group Galleon. Formed 25 years ago Galleon now play mostly in Germany. As Guest's of multi award winning band De Hohner Band, they last year played in the Koln Ice arena to an audience of over 15,000 people. Andy's songs "Home" and "Ripple" have become regulars on the Galleon set list and have seemed to secure him a place in the hearts of the many loyal Galleon Fans. Andy also spends a lot of time in studio writing new songs with the intention of releasing a new CD in early 2007 and also supplying other artists with new and fresh material.